Social Citizenship and Care in Czech Society | Sociologický ústav AV ČR, v.v.i. Hašková, Hana, Zuzana Uhde (eds.). 2009. „Social Citizenship and Care in Czech Society.“ Pp. 15-34 in Hašková, Hana, Zuzana Uhde (eds.). 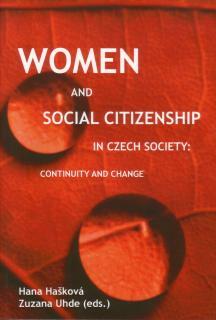 Women and Social Citizenship in Czech Society: Continuity and Change. Praha: Sociologický ústav AV ČR, v.v.i. 245 s. ISBN 978-80-7330-150-7. The authors argue that the recognition of care and carers in society requires rethinking of the citizenship paradigm focused on paid work and ideal of the independent individual. The obstacles for gender equity are addressed by examining the social organisation of childcare as a paradigmatic example of male (and also ethnic and class) bias in the construction of social citizenship as it is applied in most European states.